Former president Olusegun Obasanjo has declared he is ready to again sacrifice himself for the country's growth, development, peace and unity. He restated that the situation in country presently should not be accepted by "any right thinking" Nigerian. 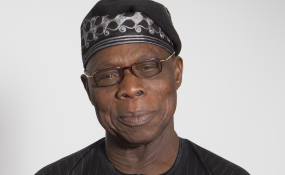 Obasanjo spoke when People's Democratic Party (PDP) presidential aspirant Attahiru Bafarawa led a 20-man delegation to seek his blessings for his presidential aspiration in Abeokuta. Obasanjo said if he could stand during the civil war for Nigeria's unity, "I will still sacrifice again for Nigeria to have a better country." Obasanjo told Bafarawa, "You are qualified to lead the country in the quest to have the desired change. The qualities included diligence, humility and non-ethnic trait." Obasanjo however noted that for the change to come, "we must all come together to arrive at a consensus." The former governor of Sokoto state had earlier described Obasanjo as a father, whom he must first visit to intimate and seek prayers from about his aspiration. Bafarawa hinted that Obasanjo's guidance assisted in no small measure, the success he recorded during his tenure as the governor of Sokoto state. He also disclosed that Obasanjo's administration was devoid of politics, as he related well with opposition governors even to the envy of members of his party.